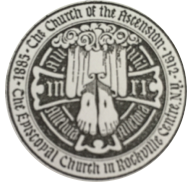 The Church of The Ascension is located in the Village of Rockville Centre, Long Island. We are 45 minutes from NYC by car and about 30 minutes by train. The church is located two blocks north of Sunrise Highway on North Village Ave. Exit 19S off the Southern State Parkway. The church and its Parish Hall are right next to the Long Island Railroad. The LIRR parking lots provide ample free parking. We are 30 minutes from NYC on the Babylon line of the LIRR. Get off at the Rockville Centre Station.